Minnie Valenzuela dropped an abusive boyfriend, alcohol, cigarettes, bad-self esteem, and more than 60 pounds! I was always the chubby girl who shied away from sports. Truth be told, I hated my body. So when I finished high school, my mom gave me a gym membership and a prescription for weight-loss pills. She was trying to help me, but little did she know she was making things worse. So, I started to do two hours of cardio per day and ate just vegetables or pineapple and wheat germ. I went from 144 pounds to 116 pounds in one year. I was so happy with my body, but I was also frustrated. I was weak and was admitted to the emergency room for symptoms that I now realize had to do with my diet. There were times that I wasn&apos;t able to finish my cardio routine because I felt so weak. Later that year, I started my first job and began a relationship that consumed most of my time. I left the gym and dedicated my time to study, my career, and my boyfriend. It was too late when I realized I was in an abusive relationship, but I was too afraid to talk about it. So I befriended food. I gained more than 50 pounds during those three years that I spent with him. I laugh now, but I will never forget his words when I talked about marriage: "I&apos;m not going to marry you because you are too fat, but I won&apos;t leave you because I know you will lose weight and will get a new boyfriend." When I finally got the courage to leave him, I partied with new friends: alcohol and cigarettes. I was at my worst when, after a few months of leaving him, I found out that one of my good friends was dating him. I had never felt so low. I knew I needed to get help and went to a counselor. When those wounds healed, I was able to think about other things. I realized how obese I was and I began hating my body again. But I didn&apos;t do anything about it; I just kept hating, drinking, and partying. I was drunk at the beach with my friend one day when a friend asked me if I was planning to stay fat forever. Right then and there, I decided to change. When my friend felt my sadness and frustration, he offered me guidance to lose weight the right way. 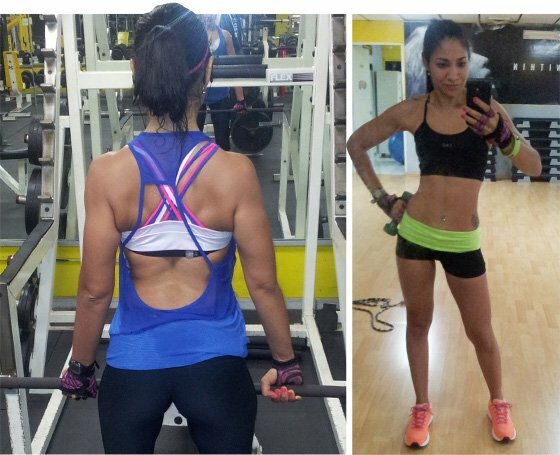 "Within three short months, I created the body I dreamed about. I did it through eating and exercising." First he taught me about the importance of nutrition. In the first week, I lost 10 pounds just by changing my eating habits. I was hooked. Next, he sent me to Bodybuilding.com and showed me Shani Ariel&apos;s Transformation of the Week. After reading that story and several other transformations, I created my own BodySpace profile. Three weeks later, I joined a gym and started lifting weights. I started losing weight like crazy! After two years of being healthy and happy, I decided that I want to beat my plateau and create a bikini body. I joined [bikini competitor and personal trainer] Kelsey Byers&apos;s challenge and hired her nutritionist for Skype sessions. It&apos;s amazing how technology works! Even though I&apos;m in Panama, I was able to get proper guidance. Within three short months, I created the body I dreamed about. I did it through eating and exercising. Be patient and consistent. This is a lifestyle and the goal is lasting change. Surround yourself with people with similar goals. I created a new circle of online friends, and I love it. I know people all around the world who encourage me to keep going. Don&apos;t keep your goals to yourself. If you are struggling with something, look for help. Share your achievements—you can motivate others! Panama has a huge obesity problem. Our traditional dishes are mostly fried. Regardless of how the fitness community has grown in Panama over the last few years, it&apos;s still really hard to find healthy meal options. It is easier and cheaper to find unhealthy food. Apply Here To Be An International Transformation!